As an Expert in human resource age HR Bangladesh has enough knowledge in recruitment and selection process . Our human resources department has the support and expertise of employment specialists who assist hiring managers with the procedures to ensure your company leaders are making wise hiring decisions. There are several pieces to the recruitment and selection process: sourcing candidates, reviewing and tracking applicants, conducting interviews and selection for employment. This is the first step in the recruitment and selection process. Sourcing candidates means our employment specialist is using a variety of methods to find suitable candidates for job vacancies. Sourcing can be done via online advertising on job and career sites or professional networking and participation in trade associations. As a top manpower recruitment agency in Bangladesh we are proud of our recruitment and selection process. we always use our experience and try to include new strategy to update our knowledge in the field of manpower sourcing in Bangladesh.Another creative sourcing technique HR Bangladesh utilize is monitoring employment changes at industry competitors to recruit applicants familiar with the same type of business you are operating. The next steps in the recruitment and selection process are tracking applicants and applications and reviewing resumes. Applicant tracking systems (ATS) are becoming extremely helpful to employers, and this technology aids in the management of job vacancies and applications for every open position.Our Employment specialists use ATSs to review applications and resumes. Following your employment specialist applicant review, he can then decide which applicants he wants to interview. With some ATSs, applicants can track application status. An ATS can be developed for organizations of any size, including small businesses. Conducting a preliminary phone interview is essential for obtaining information about the applicant background, work history and experience. When our employment specialist conducts a preliminary interview, the objective is to determine whether or not the applicant has the requisite skills and qualifications for the job vacancy. Consistent with widely accepted human resources practices, the Texas Association of Counties recommends, “A quick initial review will reveal those applicants who obviously do not meet the minimum requirements for the job.” While an employment specialist may probe further into the applicant experience and interpersonal skills, the purpose of this interview is to narrow the field of applicants to send for consideration by the hiring manager. 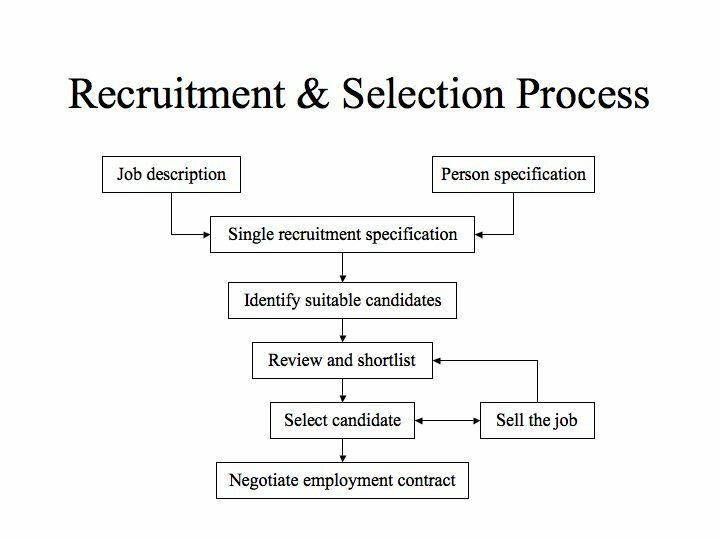 In this stage of the recruitment and selection process, the hiring manager reviews the applications and resumes the employment specialist forwarded to her. The hiring manager invites the applicant to interview face-to-face; communication about the interview and scheduling is generally handled by the employment specialist. This ensures that all qualified applicants receive the same information. At times, the employment specialist will prepare the applicant for the face-to-face interview. After the hiring manager interviews the applicant, she further narrows the field of candidates from which to select for the job opening. In many companies, there is an additional interview by the same hiring manager or perhaps a panel of interviewers. Once the hiring manager decides which candidate is most suitable for the job vacancy, time to inform the candidate of pre-employment matters, such as background inquiries, drug tests and, if applicable, licensing information. When recruiting for positions where you negotiate the terms of employment, compensation and benefits, and other issues, a draft employment offer may change hands from the candidate to the employer until the parties reach an agreement. An employment offer should always be in writing to document the terms of your agreement with your prospective employee. As a leading manpower recruitment agency in Bangladesh our Human resource consultant are always try to make the recruitment and selection process easy and effective for our clients. Our company recruitment and selection process in Bangladesh is the best way to achieve success in the business world.